In August I learned about a new product coming up for Heirloom Audio Productions. A select group of the Homeschool Review Crew would get to review the new audio adventure, Captain Bayley's Heir. Reviewers also got short-term access to the Live the Adventure Club website. My daughter and I love these audio adventures! I begged to be on the review. My groveling was rewarded! Before I knew it, my CD set arrived in the mail! I like to listen to audio adventures in the car. The CD player is right there, and car passengers are a captive audience! I took the CDs out to the car and we listened through as the days went by. The story starts out with "Mr. George" (George A. Henty) traveling in America and talking to some young men he has met about a story he is planning to write that he is doing research for. 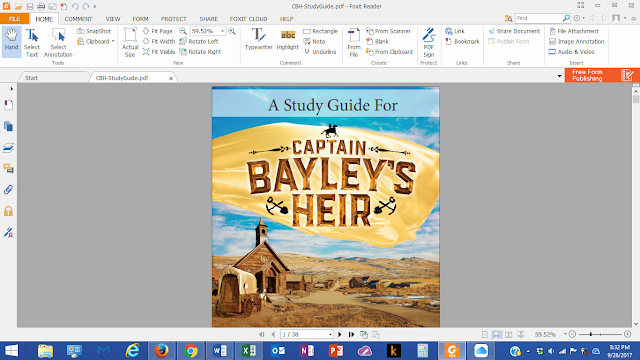 From there it jumps pretty quickly into the main story of Captain Bayley's Heir. The story begins with a crippled boy, Harry Hall, in his house playing violin. Mrs. Hall encourages Harry to go outside with the dog, Flossie, so Harry goes out using a special wagon, propelling himself with crutches. The pace changes when we learn that Flossie has fallen through the ice and is in risk of drowning. That is when we meet the hero of the story, Frank Bayley, who ignores personal risk and jumps into the river and swims to the dog and saves her. The story transitions, and we meet Frank's cousin Fred, and another "cousin", Alice, who was adopted into the family by Captain Bayley, Frank's grandfather, when her parents passed away. As the story continues, we learn that Captain Bayley had a daughter who eloped and moved away. He has tried unsuccessfully to locate her, and he does not talk about her. Frank and Fred leave to attend boarding school. Through a series of events, Frank is accused by his teacher of stealing ten pounds from the teacher's desk. Frank is judged guilty by circumstantial evidence and is to be expelled, with great humiliation, the next day. He sends a desperate plea, by post, to inform his grandfather and ask his grandfather to assure him he believes in his innocence by return post. However he does not hear back from his grandfather. In sadness, Frank escapes from his school dorm room by night and flees to America to start a new life. The second CD is about Frank's journey to and life in America. He works his way across "The Pond", proving himself by his hard work and solid ethical character. Upon arrival in America, Frank works his way to the gold fields of California. He makes friendships and partnerships along the way. Hunting for gold is hard work, and not always profitable, but Frank also is able to make money by securing and selling supplies to the miners. Meanwhile, back in England, Grandfather has had a private investigator hunting for his daughter. We learn that there is much more to Harry Hall than we had expected. Finally, Grandfather and Alice go traveling to various distant lands. G.A. Henty really knows how to weave a tale and tie up the loose ends, and the story resolves in a most satisfying manner. I don't want to give it all away -- that would spoil your fun! Suffice it to say there is some loss and some gain, and there is some reconciliation. After listening to the story I went to look at the study guide. I think a week had passed, and already I was forgetting details and finding myself unable to answer questions in the study guide! I couldn't even remember the various names of the different folks in the story! ::sigh:: So the moral of the story is that it is easier if you listen to a section, do the study guide for that section, listen to the next section, etc. Or you can listen twice, like I had to do, but I know my kids would never tolerate that! So let me tell you about the study guide. The Study Guide is a digital download. It is 38 pages long and it breaks the story into segments that you can easily follow if you have the right type of CD player that keeps track of where you are on a CD (by "track" on the CD). The Study Guide introduces you to the cast and crew of the production, and this information is also on the back of the CD case. The Study Guide is easier to read. There is an introduction explaining how to best use the Study Guide, and then there is a brief biography about G.A. Henty. Quickly you get into the meat of the study guide with questions and vocabulary words. Each section has questions for "Listening Well", "Thinking Further" and "Defining Words". The vocabulary words all seem fairly easy (as in pre-high school, or 4th through 8th grade maybe). Each of the two CDs has 10 tracks, and the Study Guide has a study section for each of these 20 tracks. In addition to the three sections mentioned above, some of the track study sections also have an "Expand your Learning" section. I saw one about various currencies, and another about the Gold Rush Mining Camps, to mention a few. At the end there are also additional suggested resources. I was also surprised to find three Bible Studies tacked on at the end of the Study Guide! That was a little like unexpectedly finding some buried gold! We really love Heirloom Audio Productions audio dramas in my house! Captain Bayley's Heir did not leave us disappointed. 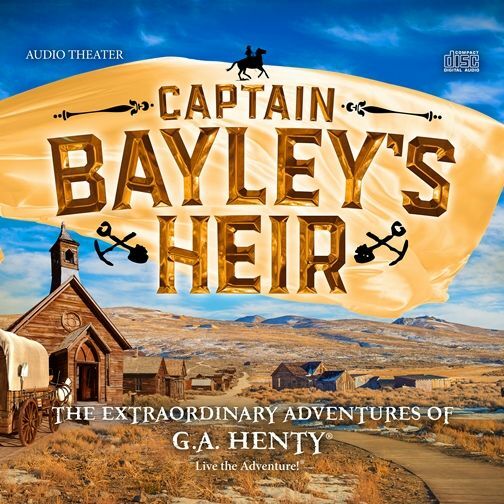 The only question I'm still a little unsure of, though, is which of Captain Bayley's Heirs is the title really about? I mean is it referring to Frank? Or Fred? Or Alice? ...Or someone else?... Listen yourself and let me know your conclusion. Other members of The Old Schoolhouse Homeschool Review Crew also reviewed this product.To see other product reviews, please click the button below. Different products were assigned for different age-grouped students. The product I got to review was the Macbeth E-Guide (for Grades 9-12). I knew my student didn't have time to read Macbeth this summer, but I was permitted to be the student for this review. I had never read Macbeth, and I was up for the challenge. One of the most interesting aspects of educating my children classically has been realizing how many classic pieces of literature I myself have never read. Even before I learned I would be on the review I dug out my paperback copy of Macbeth and started reading. Then one day I received the email from Progeny Press giving me instructions on how to download my E-Guide. I did so immediately. There was an interactive guide to Macbeth and an answer key to the same. After downloading both I made a second copy of the interactive guide so I would have one that I could fill answers in right in the PDF document. I found the Synopsis and Background Information particularly helpful. I suddenly better understood what I was reading. I was intrigued to learn the Macbeth was a fictional story that was created from some actual British history that was altered to serve the purposes of the story Shakespeare had conceived to tell! The Pre-Reading Activities suggested watching a presentation of Macbeth before reading the play. I searched Netflix and Hulu to no avail, but finally found a movie version on YouTube starring Ian McKellen. A newer version was made in 2015, but this 1978 version is just fine with me! This idea of watching the movie before reading the piece is entirely different for me, but now that I think of it I have loved the production of many Shakespeare plays that I have never read. They were, after all, originally presentations of the Shakespeare Company that were eventually written down! So, off to watch the movie! I also went to the Study Guide at this point and played "catch up", answering questions for the segments I'd already read. Most of the type-in sections worked great, but on page 11 there was a place to unscramble a sentence-long quote... with only about 10 spaces for the answer to show. I had to print that page out and write the answer in by hand. The beauty of this type of product (an e-guide) is that 1) it costs less than a printed guide and 2) you don't have to print a lot of the guide out! With a student you can have him work on line, type in the answers, and save the document. Then you can check the student's work or have the student check his own work. The student's work can be printed before checking (skipping pages you don't need to print). Or you can print out the entire study guide and have the student write the answers in by hand. I print everything double-sided in black ink only for more money savings. So many choices! I have really enjoyed working my way through Macbeth with the Progeny Press Macbeth E-Guide. So many aspects of the content and the study methods have made it easier to work my way though the play learning more and comprehending better. I highly recommend this Macbeth E-Guide for you to use with your high school students. In looking at the content, I realized that my son (scheduled to take the SAT in October) would benefit from the content of the study guide even without reading Macbeth. So I began having conversations with him about the terms I found he was not familiar with, such as soliloquy and anaphora. The Macbeth E-Guide has 54 pages and is designed to be completed in 8-10 weeks. A typical school year is 36 weeks, so if you selected four Progeny Press literature study guides, you would have material for a full-year's high school credit in Literature and Composition. Macbeth itself contains witches, murder and suicide. These are issues that different families want to tackle differently, but they should not be entirely avoided. Progeny Press provides a Biblical world view to enable you to open conversation with your student rather than ignoring these issues as if they don't exist. In addition, Progeny Press also sells the books for the study, and they have a huge variety of other study guides. I encourage you to visit their web page. Let me know what you think! To see other product reviews, please click the button below. 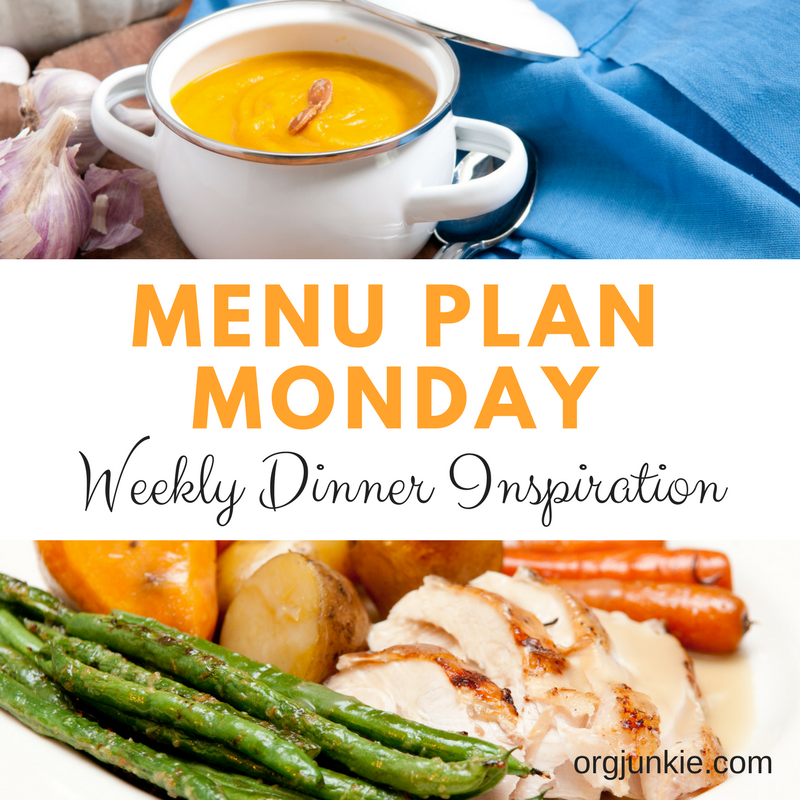 Dinner's are planned for the week, but truth be told I'm getting weary of menu planning. Nevertheless it must be done. 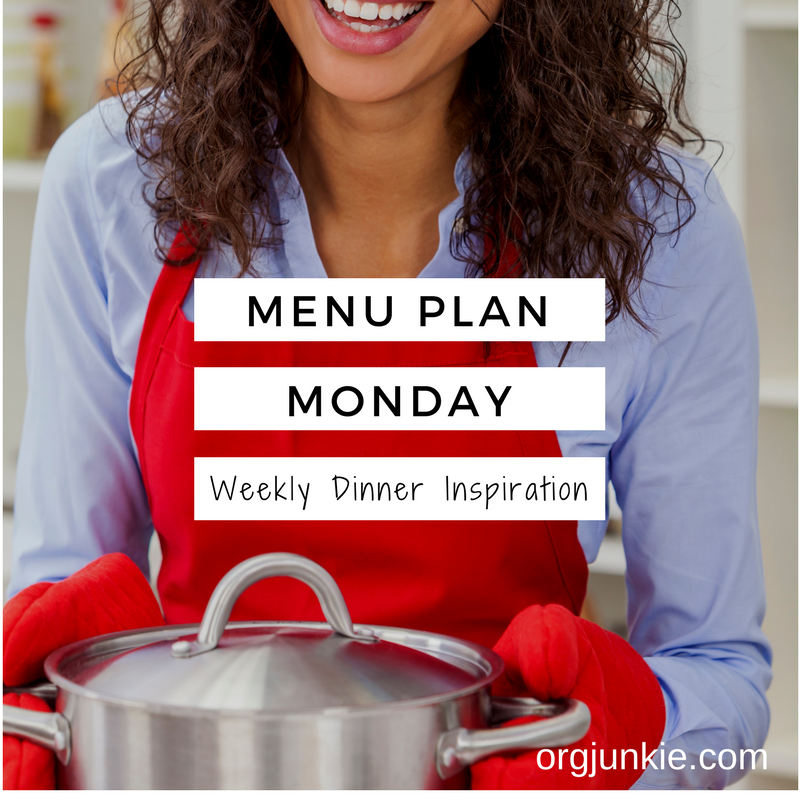 This week I had no time and plans were thrown together with haste. I shopped, and I keep finding I failed in my plans -- failed to plan part of the meal, failed to buy what I'd need... Hopefully next week will be more inspired. Anyway, here are the plans. The lad is still not driving because of right-foot surgery, so I am taxi-mom for awhile. Mondays/Wednesdays I take him to the community college at 11:00 a.m. and pick him up later at 1:50 p.m. On Tuesdays/Thursdays I take him to the community college at 8:00 a.m., go home, then back to pick him up at 9:25 a.m., go home, make his lunch and take him to a home school Geometry class at 12:30 p.m. Tuesdays, 1:00 Thursdays, only to head back and pick him up again at 2:00 when class ends. Today it was up at 6:00, make coffee, shower/dress, make breakfast/eat (feed the lad), leave home at 7:15 to go to the college, drop him at class at 7:45 a.m., head home, write a couple of checks, do some paperwork for his Geometry class group's requirements, 9:05 head out to pick up the lad. Stopped at a store (Ranger Surplus), but they weren't open. Off to allergy shots, home 45 minutes later but stop at the store on the way, make our lunches, get back in car and consume lunch while driving, drop the lad at noon/visit and settle up payment and paperwork, head to library to drop off books due. Home briefly, pull in recycling bins, try to do this post but computer won't cooperate. Back in car, pick up lad, go again to Ranger Surplus, head home, turn around and go back to college to get (expensive commuter) coffee cup lad left in class, home again. Dinner into oven to bake, and crash in chair to do this post. I hope he can drive again soon. I'm exhausted being a taxi.